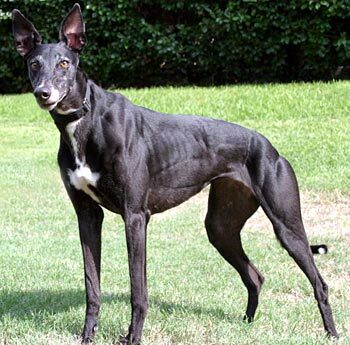 Myrtle or Myrt, aka Moaning Myrtle, is a little, 4-year-old black female born July 23, 2004. Her sire is Unruly Thomas and her dam is Chinook. 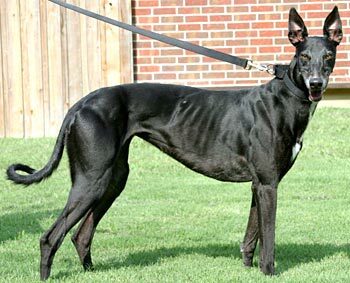 Myrtle raced only at the Woodlands track in Kansas City, KS, starting September 11, 2006, and finished on February 1, 2008. 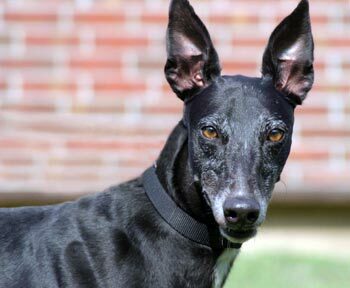 She is described by the kennel staff as "a grand little lady - sweetly comical, fantastic ears, and a curly swirly tail"! Myrtle's easy-going personality is a definite plus, also! Myrtle should NOT have cats in her future home nor be a guest where cats are present. A muzzle is a very good thing indeed. The cat was irritated with the canine teeth-chattering rudeness but unharmed, of course. She may be introduced to small dogs another time. Myrtle is always glad to get some loving and treats. She’s a sweetie; and according to the kennel personnel, she seems to love all the non-greyhound dogs as well as her greyhound kennel mates.